She is known to students as Ms. Lane, science teacher. Today she was Senior Airman Jennifer Lane, veteran of the United States Air Force. 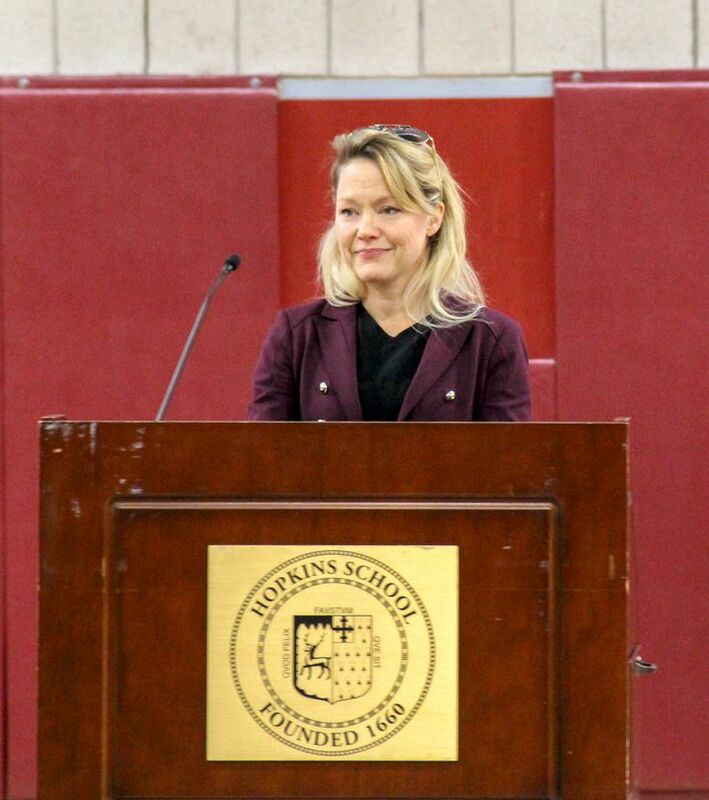 Breaking with the recent tradition of inviting alumni/ae who have served in the military back for Veteran’s Day Assembly, Jennifer Lane of the Hopkins science faculty provided the first-hand witness account of the veteran experience for students today. With her two daughters in attendance, Lane spoke of her decision to join the Air Force and the journey that shaped her life. Senior Airman Lane earned her BS in Biology and Forensics at the University of New Haven on the GI Bill and her MS in Biology Education at Central Connecticut University with partial support from the State of Connecticut for her stateside service during Operation Desert Shield. The assembly was carefully crafted and presented students with a historical and cultural context for Veteran’s Day and a glimpse into the lives of veterans throughout the ages. 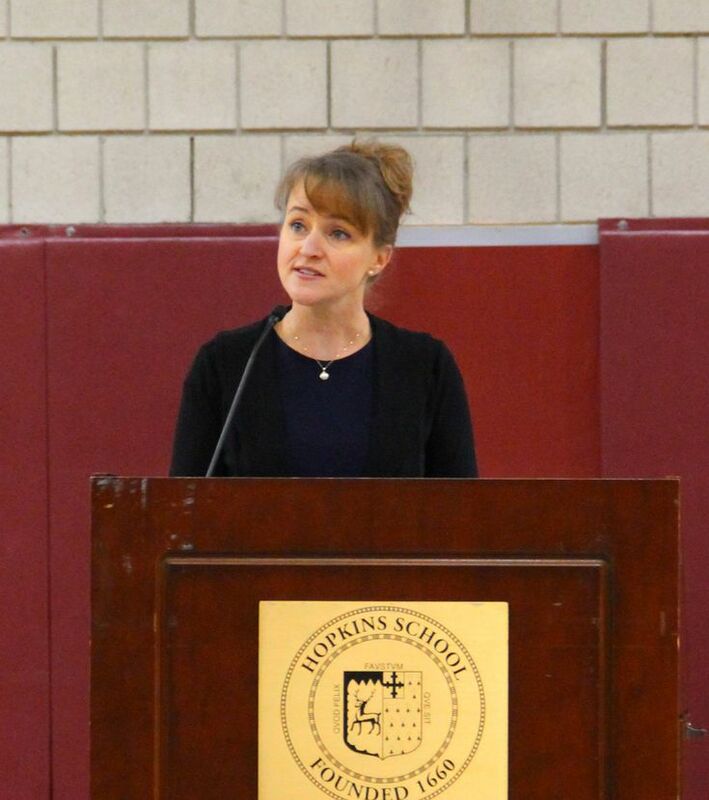 History teacher Sarah Belbita recounted the genesis of Veterans Day which began as Armistice Day, a celebration of the end of World War I--a war which was supposed to be the war to end all wars. In 1954 the name was changed to Veterans Day to honor all who have served in the armed forces. 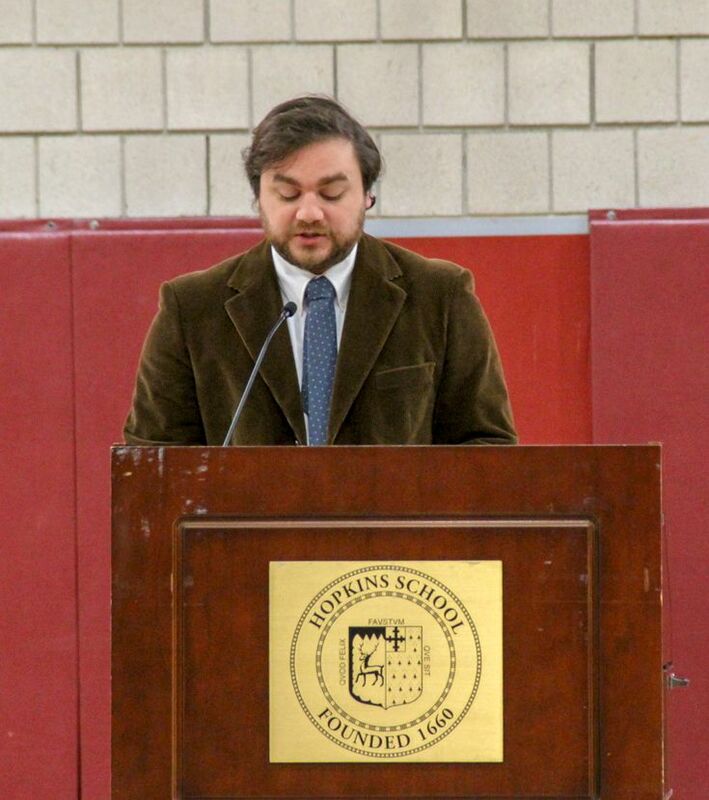 English teacher Alex Werrell spoke of Veterans Day as “not a celebration of military might or of wars won and lost” but rather a tribute to individual lives. To capture what he called “the particularity of common lives,” Werrell read letters from soldiers from the Civil War. One letter was dictated to a male nurse whose signature was Walt Whitman. But the most moving letter contained no words at all. It was a piece of paper with a drawing of the outline of tiny hand, sent by a soldier’s wife, introducing the father to his newborn baby. 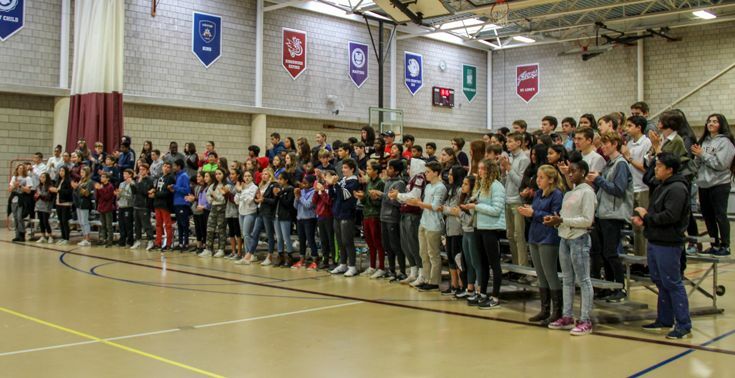 Brooke Lane ’21, shared the evolution of the military tradition of playing “Taps” to honor veterans and the fallen as everyone in the gymnasium rose for a moment of silence. From the back of the room came the haunting 24-note melody of "Taps," composed in 1862 by David Butterfield, and played by Alex Weisman '20.